The period from approximately 1150 to 1500 in Europe. The only European architectural style not based on classical forms. The Gothic period is also referred to as the Middle Ages. To the Romans, Gothic symbolized the barbarians of the North (the Goths). To the Renaissance artists the name implied the unclassical, rudely homemade efforts of the Dark Ages, where men had lost the classic touch. The only stable power of the time being the Church, the chief artistic expression was ecclesiastical. The cathedral was the triumph of Gothic art. Secular and domestic expressions lagged far behind. Gothic domestic furniture is therefore almost an anomaly. Gothic architecture grew from the Romanesque, the style of Christian Europe between 800 and 1200. Vestiges of ancient Rome, particularly the round arch, were crossed with Byzantine showiness and Teutonic naturalistic and geometric ornament. The Gothic structural system developed in stone the notion of the skeleton framework. The great pointed arches, the pillars and buttresses are decorated with moldings and details of unique and logical type. These details were carried through into the detached wood furniture, like altars, screens, and other ritual furniture. Secular Gothic art stemmed from the castles of the feudal barons. The state of almost continuous warfare kept them moving about; their furnishings and their material wealth went with them from castle to castle. With mobility as the basis, chests and coffers were the principal articles of furniture; these carried clothing, bedding, valuables; they could be used as beds and seats for the retainers. Later, chests were mounted on feet or stands, but it was not until the 15th century that there appears a consistent type of furniture foreshadowing the various cupboards, chess, and cabinets. These were invariably of oak. Furniture, usually of unpolished oak, borrowed its decorative character from Church art. Carving in oak makes for large-scale, not too fine detail. Panels were ornamented with linenfold, tracery, or painted designs. Familiar floral forms, vines and leaves, with grotesque animal and human representations were often humorously rendered. Simple structural embellishments, such as grooves, moldings, and paneling, were typical; in later Gothic work these were scaled down to represent architectural arches, tracery, façades. Cusped arches, trefoil, quatrefoil, etc. ; ogee curves and deep, full moldings were essential in the style everywhere. Painting later became general. Essential elements Gothic motifs such as tracery, arches, rose windows, and quatrefoils. Bold turned or cutout parts. Spiral or spool turnings (in Elizabethan style). Woods Walnut; also mahogany, rosewood, cherry, or oak. Notable forms Tall-back chairs, some with upholstered backs. Footstool. Bed. Sofa and settee. Extension and center tables. 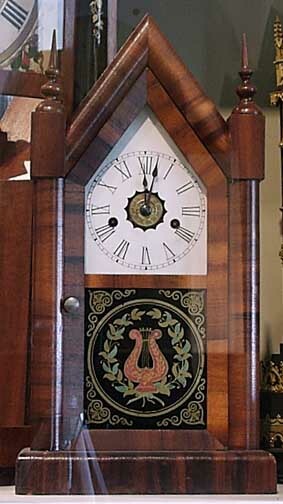 Between 1840 and 1900, the "Victorian" period, designers turned to more than half a dozen earlier styles for inspiration. The Gothic Revival is the first of several mid-19th-century styles explicitly labeled "revival." The Gothic furniture in America was an adaptation of Gothic architectural form and ornament. Designs for this type of furniture were first published in England by Thomas Chippendale in his Gentlemen and Cabinet Maker's Directory in 1754. The designs show straight legs, tracery, and chair splats that form pointed arches. The style was encouraged by Andrew Jackson Downing's home in Newburgh, New York, and by his two books, Cottage Residences, and Architec-ture of Country Homes. Most of the pieces were made of walnut. While this stylewas not overwhelmingly popular in this country, between 1830 and 1840 it wasused by architects and well known cabinetmakers. American furniture made between 1840 and 1860 was meant to be used in the Gothic Revival homes of the period, and the furniture was embellished with tracery and other Gothic carving such as quatrefoils and trefoils. The rose window and pointed arch, for instance, became the basis of a number of designs for the tall backs of chairs. This idea of trying to make a piece of furniture resemble a scale model of a building reappears in every revival of classicism. In contrast is the homogeneity of the design whose ornamentation is an essential part of the whole structural method, exemplified in Gothic and French Rococo furniture.